Some HUGE improvements have been made this week. This Mommy is about weeping with joy! These may seem small to some, but we’ve kinda been in a plateau on both feeding and speech lately (speech being pretty much since forever.) So these steps are very much celebrated!!!! We bought Annabelle a ride-on “bike” for Christmas, and Scott just put it together this past week. 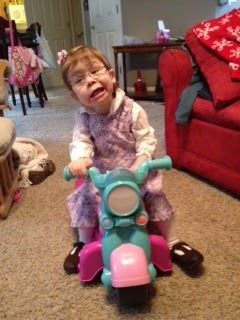 Annabelle LOVES her bike that we use at PT, but she would never do a push-with-her-feet-on-the-floor kind. But she’s doing AMAZING with her bike at home! 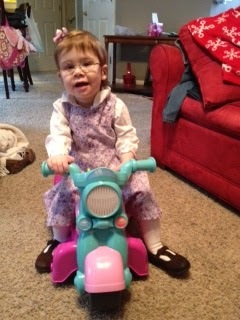 This is her sitting it before church on Sunday, ready to ride. And this is her pushing the button that makes a silly sound… which makes her make this silly face EVERY. SINGLE. TIME. she pushes it. Oh my goodness. I laugh every time I look at this! Yesterday… Annabelle bit an apple. Like teeth on it, cut it in half, hear it crunch kind of bite. I almost cried! She didn’t eat it, but she got a mouth full of the juice when she did it. This is a HUGE step, since previous to this, she’d only ever crunched a goldfish, and that was VERY rare. AND… if that wasn’t enough, she also put string cheese in her mouth and bit that too.. a lot!!! No chewing up and swallowing… but this is progress. BIG progress for my sweet love. We aren’t in actual therapy yet. GOIng through some insurance changes and need to figure out how all that is going to work, then will go about enrolling her. But.. her new eartubes seem to be having a positive effect. I have a feeling we’ll be hearing some more words in the next few weeks/months, and I am SO SO SO excited to hear them! I LOVE listening to my sweet miracles voice!! *note* I know she has no glasses in the video… she had thrown them at home and after searching the house, I couldn’t find them ANYWHERE. Later that night, I found them in some obscure place that she’d thrown them. Love that tricky girl!! Oh my goodness! That video made me tear up and laugh out loud at the same time. That is awesome! Yay Annabelle … and yay you, Krista, for getting this far already with her progress. You all are real troopers! God bless! Love all these updates. Thank you for opening your world to us. Love hearing the updates, especially when it is such good news! I love the silly face she is making on her push bike. Thanks for the video, too. I love hearing her words and seeing show-off by letting go and clapping! As a momma who knows what it can be like to have delayed milestones, I know these are huge! We're celebrating and cheering right along with you! YAY for words!!! on a person note, I used to LOVE that swing that she is using. it was my favorite one that I used when i was in therapy! It is her favorite too!!! We've tried her once on the "swing" that is like a big girl swing,a nd she did decent on that, but still loves her platform swing! I'm excited to hear about all the progress Annabelle is making. Rejoicing with you.